Newbie at Czech Climbing? Start Here! Getting Started with Czech climbing: where to climb in Czech, in Europe and around. How to climb and who climbs here - especially Czech Rock Stars. And how to use this site. How to use this site CzechClimbing.com? CzechClimbing.com is community website where the content is generated by users, climbers, mountaineers. It the main platform about Czech climbing, bouldering and mountaineering in English. (Its Czech version is under the domain www.lezec.cz). Everybody can not only read but also directly enter an article, data about the climbing routes in Routes Database (over 75.000 routes), questions to Forum, non commercial ad to Classifieds section (Advertising), everything even without registration. The group of voluntary admins then moderate the site to be the most useful for the audience, the community. You can also send the text to admins by email. And email is the only way how to publish photos. The contacts are on the left bottom column (or just write me standa@lezec.cz). 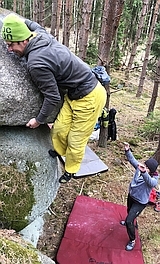 Brief review about climbing possibilities in Czech Republic. There are probably the best known sand stone areas in the Northern and Eastern Bohemia (the Czech Republic consists from two historical lands: Bohemia on the West and Moravia on the East). The climbing is quite challenging there, some one would say dangerous. The rules are traditional and according to local conditions there is not easy to do modern sport (French like) routes. There are however others excellent areas: limestone is not far from Prague, another one is around Moravian city Brno, there are more several good possibilities on granite crags and on other kind of firm rock. There are more and more gyms in the country. The gyms are also listed in the Climbing Maps where you can look for your nearest. Czech Rocks Stars: Adam Ondra, Tomas Mrazek etc. We proudly cover the news, cooperate with and sponsor the Czech Rock Stars who dictate top levels in the World climbing. The stars as Adam Ondra, Tomas Mrazek and Lucie Hrozova have their climbing diary on our website. Look in to the actual and historical rankings. And on contrary the foreign Rock Stars for example Lynn Hill, Chris Sharma, Dani Andrada or Dean Potter visited Czech Republic and we have had good luck to could stay with them. Check the names of the Stars in our search. CzechClimbing.com covers also all mountaineering disciplines including big walls, ice climbing, ski mountaineering, trekking. 1. How to (Czech) climbing - What is the climbing about?